BOS Orangutan Releases: Leonie the Late-Riser! JANUARY 21, 2019 — Monitoring released orangutans in the forest is by no means an easy task, as they move around quite a lot in their search for abundant food sources. Orangutans spend 70% of their time foraging and feeding throughout the day. Therefore, it is no wonder that natural food sources – fruits, leaves, and other types of forest fare – in certain areas can start to run low. 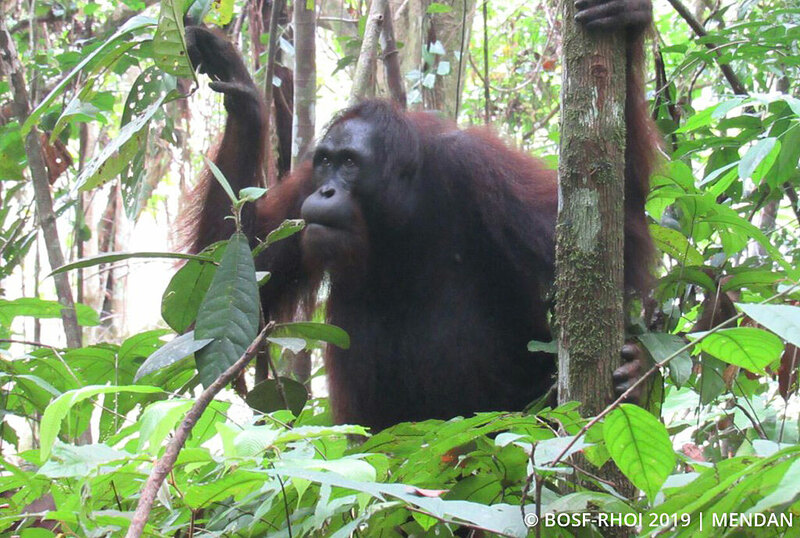 Given this, orangutans need to explore the forest extensively in search of food. 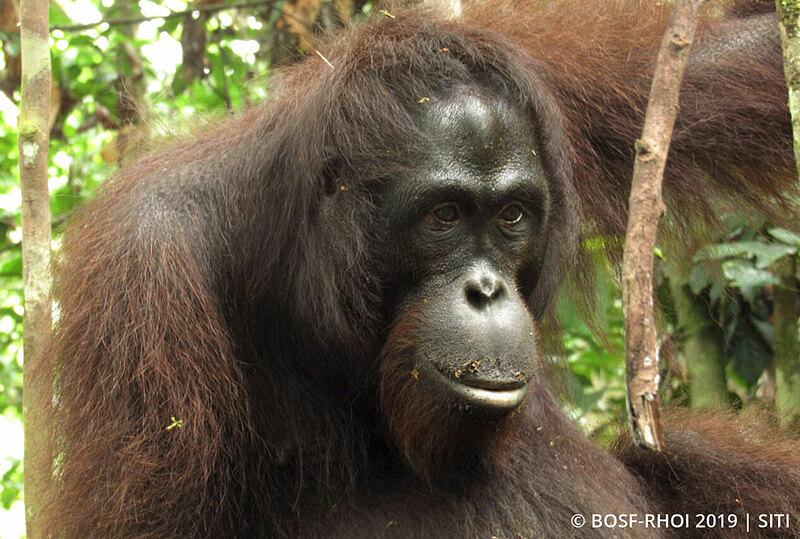 Their explorations of the forest and large home ranges, with the ability to roam as far as 10 kilometers a day, makes them excellent seed dispersers for certain tree species, but it can make it very difficult to locate orangutans in a wild habitat. Our Post-Release Monitoring (PRM) team from Nles Mamse Camp in the Kehje Sewen Forest recently monitored Leonie, after experiencing difficulty in locating a different orangutan. It was a relief to pick up Leonie’s signal after searching for the other orangutan for so long, to no avail. Our PRM team had left Nles Mamse Camp early in the morning to conduct a routine patrol, and immediately picked up a signal from Leonie not far from camp. What luck! Leonie hadn’t been seen for about three months, and detecting her signal was a good way to start the day. The team quickly headed in the direction of Leonie’s signal. As the bearing indicated, Leonie was in an area we refer to as ‘Puncak Palem 1’, about an hour’s walk from camp. As the name suggests – ‘puncak’ means ‘peak’ – this area is at a high altitude, with hilly terrain that is not easily accessible. When we arrived at Puncak Palem 1, however, Leonie was nowhere to be seen. The signal was still traceable, and the bearing was rechecked to confirm the source location, which in itself was quite a challenge due to the dense forest and altitude. Initially, the team was worried; based on experience, a continuous signal coming from one point over a period of time typically indicates a problem with an orangutan. After walking around the area for more than two hours, the team finally spotted movements in the trees above. The time was nearly 11 a.m. – yet, here was Leonie, waking up late! It was a complete shock to see Leonie rising so late, as most other orangutans would have been up and active from the early morning. Leonie got out of her nest and slowly moved toward a branch, still half-asleep. She was even seen yawning and rubbing her eyes. After eating a small pile of fresh young leaves, Leonie became more alert. She began to move quicker and dangle from the canopy, savouring fruits and leaves along the way. Whenever she happened upon an interesting food source, Leonie would slow down and eat heartily. She also climbed down to the forest floor to pluck shoots. That day, she ate several types of food, including Etlingera shoots, forest fruits, and bark. Our initial concerns that day vanished after witnessing Leonie forage and move actively in the forest. She appeared to be in good health and had gained some weight. By all indications, Leonie seemed content with life in the wild. Our PRM team members wrapped up the day’s observations and headed back to camp, delighted in the knowledge they had observed Leonie living the good life in the Kehje Sewen Forest. Please make a donation to the BOS Foundation today!